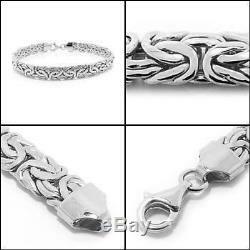 Bold Polished Byzantine Bracelet 14K White Gold. A look that's bold in gold. Intricately woven brightly polished wire creates the domed shape of this 14K gold Byzantine bracelet. Secures with a lobster clasp. Product Details: 14K White Gold (STAMPED 14K) (Not plated, Not filled). Width: 7 mm= 5/16 inch. Length: 6 1/2", 6 3/4", 7", 7 1/4", 7 1/2", 7 3/4", 8", 8 1/4", 8 1/2", 8 3/4", and 9. Please do not forget to type the length you want during the checkout. Weight: 7.60 grams (9). All of our items come with a FREE attractive gift box! LOCAL PICK-UP AVAILABLE on ALL ITEMS. BESTGOLDSHOP NEVER SELLS GOLD PLATED or FILLED ITEMS. A BOUT US We at BESTGOLDSHOP proud to offer high quality pieces at extremely reasonable prices such as this one, therefore, every item is guaranteed to surpass your expectations. We are manufacturers as well as a full service fine jewelry store, and with over 23 years in the business, we want to make "YOU" a customer! BESTGOLDSHOP offers the finest selection of Quality Diamonds & Jewelry at Wholesale Prices. Located in the world famous diamond district of Manhattan, we ensure that you will NEVER PAY RETAIL PRICES AGAIN... Local Pick-up is available for all items. We will be more than happy to have you in our office. We do not accept personal checks. R ETURN POLICY Your satisfaction is very important to us. Items must be in their original condition, not worn, or altered. We will provide the return address. For "Exchanges" or "Replacements, " please contact. This will protect you in case your jewelry is lost in transit. We are not responsible for the lost return packages. The item "Bold Polished Byzantine Bracelet 14K White Gold QVC" is in sale since Friday, May 14, 2010. This item is in the category "Jewelry & Watches\Fashion Jewelry\Bracelets". The seller is "bestgoldshop" and is located in New York, New York.